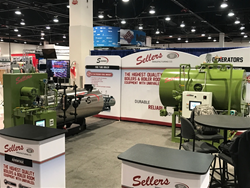 Sellers Manufacturing Company designs and manufactures innovative industrial integrated boiler/burners and associated equipment in conformance to ASME, National Board, UL, ETL and other requirements for over 85 years. All products are designed and Made in the USA at their Danville, Kentucky facilities. More information is available at http://www.sellersmfg.com or contact Sellers at +1 859-236-3181.